Wherefore art thou, Gnomeo? Atop the box office, that's where. Walt Disney's "Gnomeo&Juliet," an animated 3-D twist on "Romeo and Juliet," took in $14.2 million in its third week of release, leading the box office on Oscar weekend, according to studio estimates Sunday. In a lighthearted, G-rated version of the Shakespeare drama, the film uses garden gnomes in roles usually reserved for heavyweights of the stage. It was a surprising upset win for "Gnomeo," which bested underperforming debuts from Owen Wilson and Nic Cage. The Farrelly brothers' R-rated comedy "Hall Pass" earned $13.4 million for Warner Bros. Cage's 3-D actionfilm "Drive Angry" took in just $5.1 million for Summit Entertainment. The Liam Neeson thriller "Unknown" earned $12.4 million in its second weekend of release, bringing its cumulative total to a solid $42.8 million for Warner Bros. In its third week of release, Paramount's 3-D Justin Bieber concert documentary, "Justin Bieber: Never Say Never," took in $9.2 million. To boost repeat business from die-hard Bieber fans, the film was re-edited by director Jon Chu in a "fan cut," made using suggestions from the teen pop star's rabid following. But the weekend belonged to "Gnomeo," which didn't take no. 1 until this weekend. "Gnomeo," whose lead characters are voiced by James McAvoy and Emily Blunt, has now earned a total of $75.1 million. "It is one of those wonderful little benefits that you don't see coming," said Chuck Viane, head of distribution at Disney. Viane credited the unlikely success of the film to good word-of-mouth, the lack of family film competition in the marketplace and that a G-rated film built on afternoon moviegoing need worry less about audiences staying home Sunday night for the Academy Awards. "When most people are sitting down to watch the Oscars, we will have had the vast majority of our business," said Viane. Academy Awards weekend is historically a weak moviegoing time, though some moviegoers use the chance to catch up on Oscar-nominated films still in theaters. The best picture favorite "The King's Speech," from the Weinstein Co., saw its grosses jump 17 percent over last weekend's. It added $7.6 million in its 14th week of release to boost its total to $114.5 million. Results were poor for Cage's "Drive Angry," which follows the weak debut of his "Season of the Witch" in January. That film opened to $10.6 million. The heavily promoted "Hall Pass," which stars Wilson and Jason Sudeikis, also underperformed. "It's a tough weekend because you don't really have a full Sunday," said Dan Fellman, head of distribution at Warner Bros. "It's very difficult to project on Academy Sunday." Hollywood.com analyst Paul Dergarabedian, however, notes: "Kids don't care about the Oscars. They just want to go to the movies." 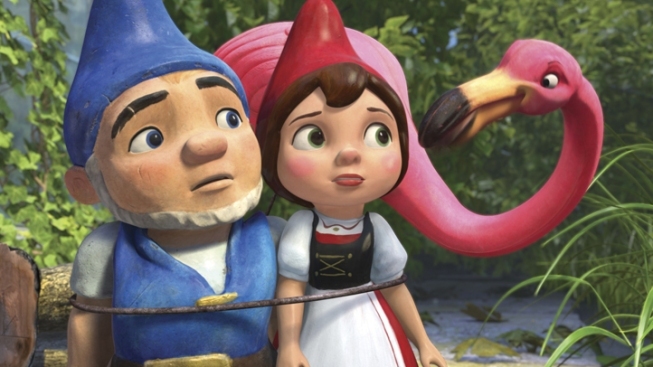 Though the unexpected success of "Gnomeo" is good for the moviegoing business, it was still a down weekend for Hollywood, with the total box-office less than the corresponding weekend last year. That has been a common theme in 2011. Grosses are down 21 percent from last year. "As the industry celebrates its best of last year, we're definitely still in this box-office malaise," said Dergarabedian. 2. "Hall Pass," $13.4 million. 4. "Just Go With It," $11.1 million. 5. "I Am Number Four," $11 million. 6. "Justin Bieber: Never Say Never," $9.2 million. 7. "The King's Speech," $7.6 million. 8. "Big Mommas: Like Father, Like Son," $7.6 million. 9. "Drive Angry," $5.1 million. 10. "True Grit," $1.9 million.